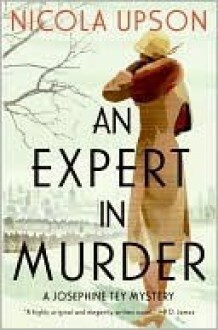 "An Expert in Murder" is the first in a new series which features Golden Age crime writer Josephine Tey as its lead character, placing her in the richly peopled world of 1930s theatre which formed the other half of her writing life. It is 1934, and celebrated Scottish crime writer Josephine Tey is on her way to London to see her hit West End play - but her trip is interrupted by the grisly murder of a young train passenger.Detective Inspector Archie Penrose is convinced that the killing is connected to Tey, and that somewhere in the flamboyant theatre world lurks a rughless and spiteful killer wwho is out to ensure she becomes a victim of her own success.Cleverly blending elements of the Golden Age author's real life with a gripping murder mystery, "An Expert in Murder" is both a tribute to one of the most popular writers of crime and a richly atmospheric detective novel in its own right. Found this murder mystery quite interesting and entertaining, it would have been better to get to know some of the characters better. Nicely done. Probably would have got 4 stars if I had read it 20 years ago as I enjoyed the traditional murder mystery much more then.